My "crackpot theory," for which I am going to try to provide evidence, is that the so-called "tarocchi of Mantegna" may have been designed in 1450'S Bologna, and engraved by 1467, probably there as well. Actually, it is not my idea, but my version, incorporating the new research, of an old idea once advocated in Italy. I will present it in relation to both the current art historians, who have declared for 1460's Ferrara, and Trionfi, which prefers c. 1474-1475 for the complete set of designs and Rome for the engravings. At the risk of giving you too much information, I will toss the whole thing out at once, as far as I’ve got. Details of abbreviated references are at the end. And no, this is not a parody of someone else's Bologna theory. The first question I will address is this: in the style of what artist are the designs? To focus this question, here are two paintings done c. 1450 in Ferrara, along with the E series engraving of the "Mantegna's" Euterpe, one of the series of nine Muses. It would appear that the top half of one painting and the bottom half of the other combine to make one "Mantegna" Euterpe. Art historians today agree, on good evidence, that the left-hand painting, now identified as the Muse Polyhymnia, was done for Leonello d'Este's studiola in his new Belfiore Palace, c. 1450. The other, Euterpe, is not much mentioned, but when it is (Gombosi, De Romanis), it is usually located at the same place. The palace and studiola were destroyed in one of the disastrous earthquakes, probably that of 1593, but likely eight of the paintings are still extant, in various museums, with various histories, and in various styles. (A convenient website to see seven of them, lacking only the one on the left above, and with a good summary, is Allesandra De Romanis's http://www.italica.rai.it/rinascimento/ ... lfiore.htm; I get from a post of Marco's on another thread.) In several cases, as x-ray studies have confirmed, paintings in one style were painted over, partly or wholly, and redone in a different style. The repainting is in the style of Cosmé Tura, and so by him and perhaps an assistant in the late 1450's, probably at the request of Borso d'Este, who succeeded Leonello as Marquis of Ferrara. The paintings loosely follow a program for them written by Guarino da Verona, Leonello's old tutor (Campbell 1997, p. 31, with the Latin original on p. 169). The Malatesta Chapel in Rimini followed his program more precisely. A quotation from the program actually appears on one of the other Belfiore Muse paintings. 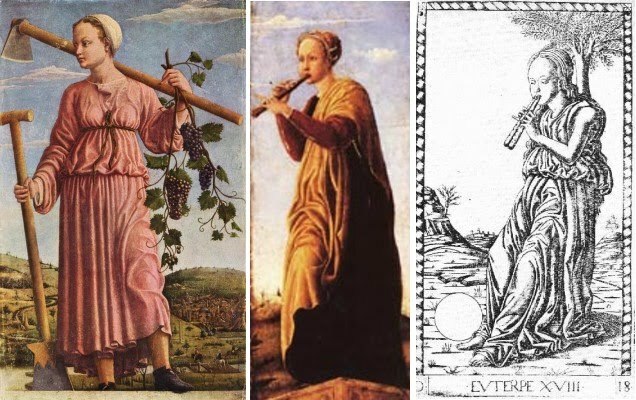 In Guarino's program, Euterpe was Muse of the pipes, and Polyhymnia, Muse of crop cultivation. The Euterpe appears to have been had part of its left side removed, as it is narrower than most of the others, although exactly the same length. Probably the same is true of the third one, identified as Melpomene, having the same dimensions. What happened to the three after the Belfiore? According to 19th-early 20th century art historian Adolfo Venturi (p. 29), the two narrow ones served as side-panels in a Bologna church, as "angel-musicians," in Venturi's phrase, and then resided in the collection of Marquis Nerio Malvezzi of that city. They are both now in the Fine Arts Museum of Budapest. The Polyhymnia has been in Berlin since at least the 19th century. The former, conspicuous for her dress embroidered in purple and gold, and for her blue chlamys, holds in her right hand a trumpet, in her left an open book, and with a certain modest hilarity in her expressive face, and something of a glance of her eyes, seems to urge men on to glory (Venturi p. 28f). This painting, although its description reminds me of a certain Vermeer (http://www.essentialvermeer.com/catalog ... nting.html), seems to have been lost. The "Mantegna's" Clio (at left, below) has something of the same mood, but with different accoutrements. Her shoulders covered by a purple robe, she lightly touches the strings of her harp, turns her rapt gaze towards Olympus, and with modest and grave enthusiasm tunes her songs to the harmony of her chords.
. He also mentions flowers at Melpomene's feet, painted so realistically that they deceived the bees (he is repeating a standard phrase, probably deriving from a classical source such as Philostratus). The Budapest Melpomene painting (center above) seems to have the same robe and harp. Oddly, Venturi did not identify this description of a Muse with the painting at all, but simply called it an "angel musician." Perhaps he considered it too great a departure from Ciriaco's description, because of the improbability of flowers, and because she does not appear to touch the strings. But these are fine points; Ciriaco was a merchant, a promoter of goods, albeit one who had been to Egypt and knew his antiquities. To her right above, I put the "Mantegna" Melpomene. Obviously we do not have a match. The engravings are the product of a different environment, either with a different patron or one who changed his mind. But the style is similar. I will elaborate further on this point later. The painter, whom Ciriaco called Angelo Parrasio, is also known as Angelo Maccagnino; he came to Ferrara from Siena in 1447, and Leonello put him in charge of the Muses project. Georg Gombosi, writing in 1933, attributed the Euterpe and the Melpemone to him. More recently Jill Dunkerton (2002, p. 114) attributed the Polyhymnia to him as well. But most scholars today disagree: none of the three is in Angelo's style. Dying in 1456, he was already old in 1450, and painted in an older style, visible e.g. in the upper body of the Erato, while the others reflect a new style, like that of Piero della Francesco. Campbell attributes the Polyhymnia to "an anonymous artist influenced by Piero della Francesca (in Ferrara around 1450)" (1997, p. 33). In the caption to the painting he says "Ferrarese, c. 1450" (p. 35). He does not discuss the others, but De Romanis, in her web essay on the Muse paintings already cited, attributes all three to "anonymous Ferrarese" ("anonimo artista ferrarese" and "ugualmente di anonimo ferrarese"). Nicoletta Guidibaldi, in Prospettive di Iconografia Muisicale (in Google Books)uses the same words. Adolpho Venturi claimed that the painter of all three was one Galasso Galassi (p. 30), also called Galasso di Matteo Piva (p. 24), whom he also held, because of stylistic similarity, was the originator of the "Mantegna" designs. Venturi's opinion was reaffirmed in 1954 by Gnudi, and earlier by Longhi according to Gnudi, in a critical notice excerpted by Trionfi (in the section "Artists active in the Studiola," http://trionfi.com/0/m/16/). Gombosi, in a 1933 Burlington Magazine article (at http://trionfi.com/0/m/16/) took issue with Venturi. He attributed the Polyhymnia to Galasso but the other two to Angelo, despite the lack of similarity in overall composition and mood to the other Angelo Muses, the ones altered by Tura. (At http://www.italica.rai.it/rinascimento/ ... lfiore.htm, compare Euterpe and Melpemone to Erato, Terpsichore, and Urania.) Gombosi based his attribution to Angelo on similarities to the other Angelo Muses in the depiction of folds in fabric, and on his identification of the landscape as Umbrian. However x-ray analysis since has revealed that the folds were put there later in the repainting (Dunkerton p. 116f); as for the landscape, it seems to me rather generic, easily learned from others' example. Gombosi noted the similarity in style of the Euterpe and Melpemone to the "Mantegna," to this extent following Venturi, and identified the cards as "Ferrarese (or Bolognese, but hardly Venetian)." Galasso's name appears in one contemporary document, showing payment to Cosmé Tura and Galasso for appraising the value of some pennants done for the d'Este court in June 1451 (Venturi p. 29, Tyson p. 35). Tura was the artist in charge of painting over, in his style, all or part of some of the original paintings, all seated Muses: the unfinished Calliope completely, and three others, Erato, Urania, and Terpsichore partially (Dunkerton, pp. 108, 109, 114). So he and Galasso were in 1450 likely both students of Angelo, with similar ways of painting folds in fabric. But the three standing Muses are not in Tura's style. It is theoretically possible that he painted some of the originals in an early style and then painted over them later in a different style. But there is no documentation of Tura paintings suggesting that style. Galasso's name next turns up in Vasari (Vol. 2, 1st edition only), who says that he was trained in Ferrara and then moved to Bologna at the invitation of "some Dominican monks" (p. 126), where he died at about age 50. According to Vasari's 1871 English translator, he lived 1438-1488. Venturi says he died in 1470 and that he worked for Bessarion, the papal legate in Bologna 1450-1455. Vasari's translator mentions another account of his life in a nineteenth century Italian source, which I have not consulted. I have found only one recent art historian mentioning Galasso. Drogin, writing in 2002 of Bologna during the time of the Bentivoglio, says, "Piero della Francesca perhaps visited around 1450, followed by his student Galasso, to whom a 1455 Funeral of the Virgin is attributed (San Michele in Monte, destroyed 1831" (p. 80). Drogin does not give a reference. I have been focusing on just one of the 50 images in the "Mantegna." But all are in a similar style, if not in the same hand. (Lambert, p. 145, suggests a workshop, an "atelier." Lambert is conservator in the Departement des Estampes et de la Photographie at the Bibliotheque Nationale, and her book is a catalogue of that library’s holdings.) The Muses, Virtues, and Liberal Arts are especially similar, mostly standing figures in robes. Before the "Mantegna" images this style was not a common one: I have seen nothing quite like them, apart from the three standing Muses of Belfiore. It is not unthinkable that Galasso took drawings of his three Muses with him to Bologna and with the help of humanists there, perhaps Bessarion himself, redid them and added more. One possible such humanist is a name that Trionfi mentions in their section, "Mantegna Tarocchi Engravers," for his interest in printers: Niccolo Perrati, Poet Laureate of Bologna in 1452 (the time of Frederick III's marriage journey), sometime secretary to Bessarion. In this new environment, with new designs, it is the style that continues, not the programmatic details. Admittedly, no professional art historian today makes Venturi's leap to Galasso and Bologna. Instead, they usually say "anonymous Ferrarese," meaning "anonymous painter from Ferrara," as opposed to "painter in Ferrara," thus curiously not ruling out the possibility. Galasso was always a Ferrarese. I turn now to the engravings. Most painters did not have engraving skills. Engraving started in Germany in the 1430’s, per Wikipedia, but both Ferrara and Bologna had active engraving and printing communities in the 1450's and later, including, at least in Bologna, German shops. Lambert (p. 146) classifies the "Mantegna" as "burin proche de la maniere fine Florentine," which I translate as "burin close to the fine Florentine manner." "Burin" in English means the engraving tool; perhaps in French it means "engraving" as well. Indeed, the "Mantegna" engravings are technically similar to Florentine ones of the 1460's reproduced by Lambert. Others that she attributes to Ferrara and elsewhere she calls simply "burin," except for Florentine ones, which she calls "burin en maniere fine." (Looking at the reproductions, I can't see any difference among them.) At that time, the 1450's and 1460's, Florence was closely allied politically with Bologna, Bologna's leading citizen having grown up in Tuscany and Florence; but Ferrara was considered an enemy. Numerous Florentine craftsmen came to Bologna to build and decorate the palaces of the rich, a trend in which the leading family set a strong example (Ady, p. 150ff). We do know that the next appearance of something similar to the "Mantegna's" imagery was in Bologna, in a 1467 miniature, of an Emperor and a Pope (Lambert p. 145 etc.). The miniature is posted by Trionfi at http://trionfi.com/i/mantegna-tarocchi/index2.php. I post the relevant section below, underneath three “Mantegna” cards. Trionfi observes, in their comments below the photo, that besides the Emperor and Pope is also a figure similar to the "Mantegna" Servant, "Il Fameio." I assume they mean the person at the far left of the Pope. So above the miniature, I put all three cards for comparison. The figure of the Servant is possibly repeated to the Pope's right; but the face and costume resembles more the Merchant. I also see the Chevalier behind and to the left of the Emperor, possibly repeated on his right. And there is a bearded version of the "Mantegna" King kneeling before the Emperor. I post these three below the miniature, for ease in making visual comparisons. Possibly the four minor characters are stock figures of a generic nature. Lambert does not list them. The Emperor in the miniature is indisputably a close match with the "Mantegna" Emperor (and also the figure in its “Jupiter”: see http://trionfi.com/mantegna/e/e-mantegn ... chi/46.jpg). With the Pope there are some similarities, such as the tiara and the keys, but also some differences. His posture is different. The robe is more elaborate, filled with abstract designs. The face is different, too. So is the miniaturist's version a a more complex version of the card, but with a rounder face, or is the cardmaker's a simplification of the miniature, with a thinner face? The posture can be explained by reference to the other side of the illustration, with the Emperor: the two figures are meant to complement each other. This explanation, while accounting for the difference, does not answer our question of which came first. The face and robe, I think, demand a more complex explanation, but one that may yield more interesting results. And if not Nicholas V, there were two after him in the 1450's; even without the device, keys were associated with Popes. I cannot see how the Pope card looks more like Sixtus IV than any of these. 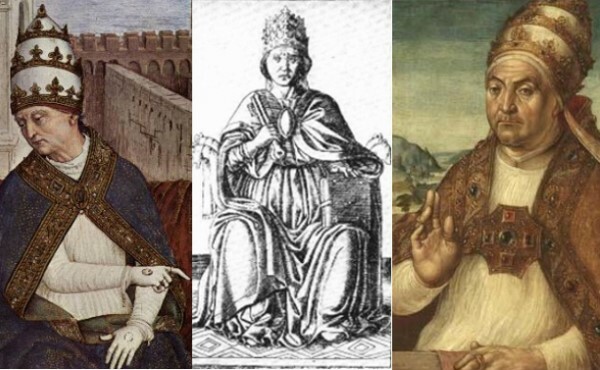 Below are Nicholas V (1447-1455) and his keys, Callistus II (1455-1458), Pius II (1458-1464), and Sixtus IV (1471-1484) (http://catholicsites.org/popes/renaissance.html), with the "Mantegna" in the middle. Actually, to me the closest match is with Callistus II and Pius II. I am not sure what is in the corner of Nicholas's portrait; perhaps it contains the keys bunched together as on the card. So we can date the miniature to the period 1464-1467, as indeed it is. But the card, based on this evidence, is likely either before or after that period. I of course think it was before. But at least we have an explanation of why the face is different. As for the robe, it may be that Paul II wore such things. The portrait posted on Wikipedia (http://en.wikipedia.org/wiki/Pope_Paul_II) shows a golden robe with intricate designs. He was 47 when elected Pope and so may have lacked the austerity that often comes with age. He had been a merchant before changing careers when his uncle was elected Pope (in the end advancing from a lower “Condition of Life” to the highest.) And the late 1460's was a time for magnificence: Florence's Medici, Milan's Sforza, Bologna's Bentivoglio, Ferrara's Este, etc. Such a robe also gave the miniaturist a place to show off his skill. Moreover, the patterns themselves have an interesting characteristic, at the top and bottom of the double key that the Pope is holding in his right hand: the patterns merge with the key edges, so that someone might not recognize the key at first. It is a kind of visual double entendre, another way in which the miniaturist shows off his skill. 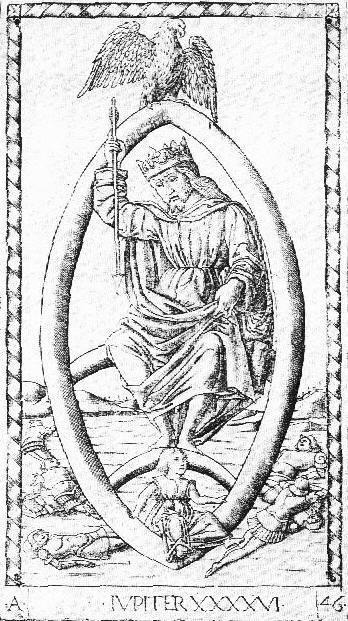 For the pun and its reference to be appreciated, however, people would likely have to have been familiar with the card; Nicholas V and other popes were not shown actually holding the keys in the manner depicted. 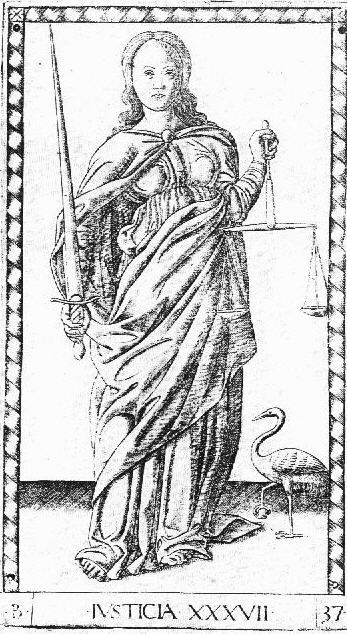 ...quatre tarots inserés dans son texte: La Tempérance, La Prudence, La Force et La Justice." "L'écriture déborde sur les marges des estampes, ce qui prouve que celles-ci étaient en place antérieurement à la composition du manuscrit"
My translation: "The writing overflows the margins of the prints, which proves that they were in place prior to the composition of the manuscript." I do not know where this book was produced, and cannot even tell what language it is in; but it clearly shows that at least these four cards were extant by 1468. Where there are four Virtues, there are probably three more. Where there are 6 Conditions of Life, there are probably more. The PMB tarot already had its Fool resembling the “Mantegna” Misero and its Bagatto resembling the Artisano. By 1468 we already have close to the 20 cards of the “Mantegna’s” 50. And the ‘Pope” card refers us to pre-1464 and even the time of Nicholas V, 1447-1455. In addition, the Belfiore 3 standing Muses account for the design of most of the Muses, Liberal Arts, and Virtues, as standing male or female figures in robes. All that is left are the Spheres, stock representations of the planetary gods. Several objections occur to me. There is of course the problem of the earlier manuscripts with, first, 2-6 images like the cards, and later 4 images of actual cards. Where there are 6 (or 10) there are probably more. There are also the Belfiore Euterpe and Polyhymnia, which seem to have inspired the "Mantegna" Euterpe and probably other of the Muses. We are to suppose that Lazarelli somehow got copies of some or all of these, and in the same style invented 27 more for his manuscript. He does not, strictly speaking, have to have had the 1467 and 1468 manuscripts, because there is no trace of either the Conditions of Life or the Virtues in his manuscript, according to Trionfi's reports. But there are the Muses and many other Muse-like figures among the Virtues and Liberal Arts; so he does have to have had images of at least one of the Belfiore standing Muses, or something like them, to get their style. After the manuscript, according to Trionfi, Lazarelli finished the set of 50. 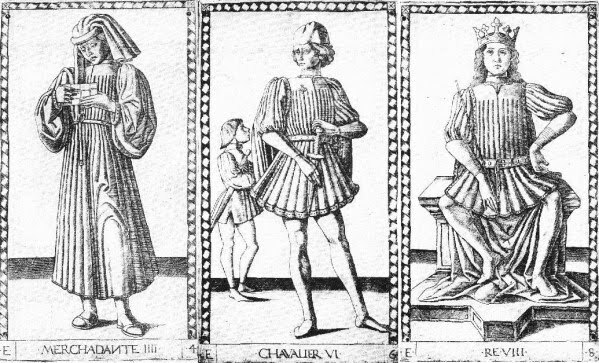 It seems to me that if so, then he must have now acquired copies of the 4 St. Gallen and at least the Pope and Emperor from the Bologna manuscript, to use as models for those cards, as well as something very close to the Belfiore Euterpe, since the designs for the Muses and Liberal Arts are so similar. All this from a person whose other documented work is in the medium of words, none of which is about any of the cards' subjects except that which appears together with the 27 miniatures. The result, one I find hard to believe, is a work that will be printed in numerous editions, imitated by famous and not so famous artists for many years, preserved carefully for posterity (in 13 complete sets of the "E" series alone, according to Lambert), and admired to this day. There may be other difficulties with the Lazarelli hypothesis, but without better reproductions of his images they must remain unresolved. There are, among other things, questions of technique and style: consistency between illuminations and cards, between the 23 "Mantegna" subjects and 4 additional ones in the manuscript (of non-planetary gods, whose imagery might well have been Lazarelli's invention), and between all of these and the 7 in the previous manuscripts. One cannot tell much from the available black and white reproductions of Lazarelli's illuminations, 9 in Kaplan (Vol 1, p. 27) and 6 more posted by Trionfi. 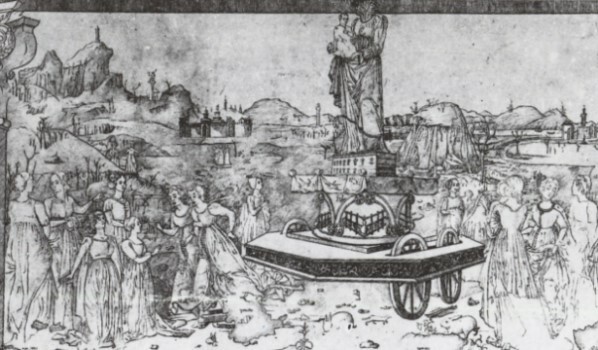 The alternative story, from whatever source (an "insecure note," according to Trionfi), is that Lazarelli picked up the designs as prints in Venice, around 1468 or 1469. As Trionfi notes, it is not clear whether on this account they were woodcuts or engravings, colored or black and white. So they could have been engravings, like the "Mantegna" we know, perhaps hand-painted, as the Sola-Busca were a little later. Or the color was added by Lazarelli. The dates make sense. According to Campbell (2004), Lazarelli's manuscript was finished by 1471. That dating is secure, according to both Campbell and Lambert, and acknowledged also by Trionfi. The reason is that on one of the two copies there are "traces of a canceled dedication to Borso d'Este," as Campbell puts it (2004, p. 127). (His reference is to an article by Lamberto Donati, "Le fonti iconografiche did alcuni manoscitti urbiniti della Biblioteca Vaticana," in La Bibliofile 1958, 60-1, 48-129.) Borso died in August of 1471; normally the dedication would be added last, in case of just such eventualities. The location also makes sense: the writing at the bottoms of Lazarelli's images, as well as of the cards, is in the Venetian dialect, suggesting prints for the Venetian or at least Northeast Italian market. On the engravings, so far I have been focusing on Trionfi's theory that they were made c. 1475, mostly from designs by Lazarelli c. 1470 but also drawing on a few designs made slightly earlier than his involvement. Art historians have a different perspective. Campbell concludes that the "Mantegna" was "devised by a Ferrarese artist and circulating by the 1460's" (2004, p. 127). Tyson agrees (p. 57), suggesting a candidate for the designer, Gherardo da Vicenza, the triumph-card maker, because his dates are right, because documents show that he designed other things for the Estensi, such as silverware, and because there are possible affinities between the cards and anonymous sections of the Schifanoia frescoes. To me that is not much of an argument for Gherardo in particular. Lambert, following Hind, simply suggests "vers 1465" (p. 145: "around 1465") in Ferrara. Her argument is the 1467, 1468, and 1471 manuscripts, and the alleged stylistic similarity to the frescoes of the Schifanoia generally, which she attributes to del Cossa. It would take me too long for me to compare the cards to the Schifanoia here. Historians writing in Italian and English say that many artists were involved; some, it seems to me, may even not have been resident in Ferrara, because Borso wanted the job done quickly. Different historians have found resemblances to different sections (although none to the one section del Cossa claimed to have done). Gnudi argues, in the excerpt posted by Trionfi (“Artists active in the studiola”), for a resemblance to the December "Triumph of Vesta." Gnudi, Trionfi says, was in charge of the restoration. I can find no pictures of this scene on the Web, and in books accessible to me only a drawing done a century or so ago (in Roettgen, Italian Frescoes: the Early Renaissance, p. 414) It is of a quite deteriorated fresco, one that looks to me rather generic Northern Italian. Tyson (p. 59f) sees resemblances to some very different figures in the June, July, August, and September sections, both men and women, in the middle and lower upper parts. To me these all look either too inventive and energetic for the cards or again generic. On the other hand, the cards are close enough to these images that they could have been used by the painters in preparation for their work, since the Schifanoia was done 1469-1471, presumably after the cards. I invite the reader to inspect the frescoes on the Web. I will expand on these points if desired. One reason that Campbell gives the 1460's rather than earlier, is his theory (2004, p. 126f) that several literary and artistic productions of that time, including the "Mantegna" and the Lazarelli poem, were reacting to the seductive, morally ambiguous nature of the Belfiore Muses, as they were in the late 1450's; they wished to present the Muses in a more elevated way. Whatever the merits of this argument, it applies only to the Tura repaintings, and not to the three unaltered ones. And it seems to me that that the tenor of the times in Ferrara, as shown by Tura's and del Cossa's intensity and the bold, warm, earthy imagery shown by much of the Schifanoia, counts against any such airy but conventional revisioning as the "Mantegna" at that time. I agree that the engravings were probably done in the 1460's; I would say perhaps before 1465. And I think they are based on designs from the 1450's, closer to the beginning or middle of the decade than the end, and more likely in Bologna than Ferrara. For Bologna, I offer (a) Galasso's move there, as the most likely candidate for the "anonymous Ferrarese" whose style is closest to the cards; (b) the marked divergence of the "Mantegna" from Borso's (as opposed to Leonello's) Belfiore Muses and most of the Schifanoia; (c) the presence there of the 1467 miniature, (d) the keys of the Pope card as Nicholas V's device, and possibly (e) the resemblance in engraving technique to Florentine engravings of the time and (f) the later presence there of the Belfiore Euterpe and Melpemone. Moreover (g), Bologna, with its internecine feuds, suffered from too much passion and intensity; the elevated but conventional mood of the cards, in contrast to the best of Ferrarese art, would have been welcome there. 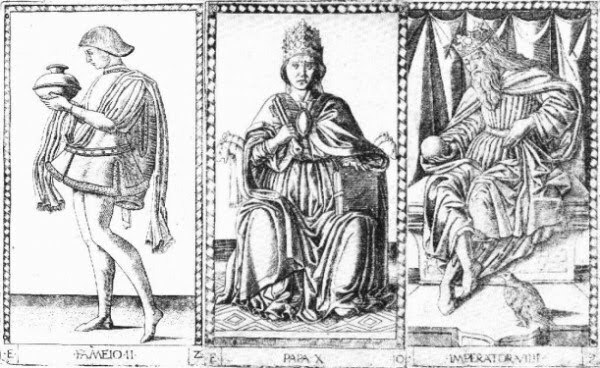 For the designs, in favor of the 1450's we have the 3 Belfiore Muses, Galasso's move, reference to Nicholas V in the Pope card, and facial features in that card similar to the Popes of the 1450's. For the engravings, in favor of pre-1467 we have the same manuscripts that the art historians cite. 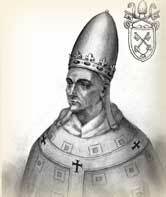 In favor of pre-1465 we have the resemblance to pre-1464 Popes and lack of resemblance to Paul II. I have no idea who the engraver was. Why were the cards made? They are visual representations of the "great chain of being," from the lowest representative of humanity to God himself. They are humanist propaganda for the adoption of the Greco-Roman tradition by artists, writers, and the educated public, and they are Christian propaganda for their subservience to Christianity. They are a defense of the power of the established social order, the Virtues, the Liberal Arts, the Muses, and the Greco-Roman myths to elevate humanity step by step to an appreciation of the divine. They might also have been an instructional card game with five suits. But if so, the instruction about many of the Muses and a few of the Liberal Arts is not very good, as many are not very differentiated from one another; the classical sources provided them with much more distinctive visual attributes. 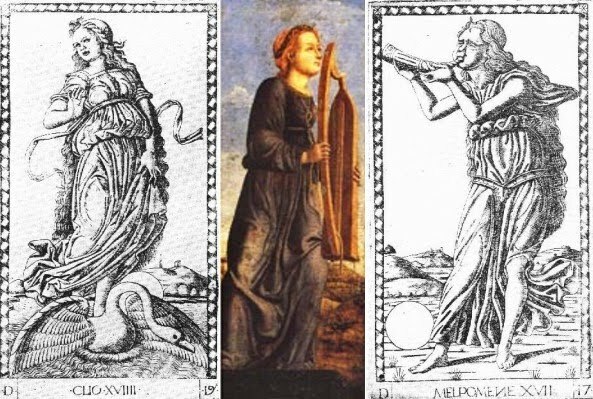 Perhaps the cards were made in connection with specific celebrations, and in something of a hurry (which would explain the repetitive nature of the Muses). If occasions in Bologna are desired, the wedding of Sante Bentivoglio and Ginevra Sforza in 1454 comes to mind for the hand-made version, and that of Giovanni II Bentivoglio and Ginevra Sforza in 1464 (Ady p. 139) for the engravings. Ginevra seems to have had a special interest in the printing industry (Ady p. 162). If Bessarion was a force behind the project--if not of the original designs, then at least of the engravings--they could have been made almost anywhere, although still from designs made in Bologna. Bessarion was based in Rome but attended the Congress of Mantua in 1459, visiting Bologna both before and after. The old story (in Seznec, p. 138f, and Brockhaus, posted by Trionfi) about Pius II, Cusa and Bessarion devising the game at Mantua could have a sliver of truth: not a game, and not Cusa or Pius, just Bessarion. Bessarion, who later, according to Wikipedia, founded the Petrarch library, was very much present at the Congress, and so were delegates from everywhere, any of whom could have participated in the project of making the engravings. But according to Joscelyn Godwin (Pagan Dream of the Renaissance. p. 50, in Google Books), Giannino Giovannoni argued as late as 1981, hopefully on better grounds than some, that Mantegna designed the cards at the Congress. According to him, Mantegna designed Virtues and Muses for his tomb very similar to the cards, which were then put there by his pupils. That last is a claim that I have so far had no opportunity to verify. If one compares Mantegna's engravings in general with those of the "Mantegna," it is clear that the two artists' styles are totally different, as revealed e.g. in how the two depict the folds in fabrics: Mantegna's are complex, even busy, while those on the cards are simple, repetitive, and calm. Yet if he did identify at the end of his life with some of the designs sufficiently to want them on his tomb, perhaps he had a hand in their production or distribution, which in fact was so wide, resulting in imitation so extensive (I have not told half), that it was easy to believe that a famous artist must have done them. For tarot researchers, the main practical consequence of my conclusions thus far, about the relation of the "Mantegna" designs to Bologna in the 1450s-60s, is that we should not rule out their influence on the various emerging designs of the tarot. As printed hierarchical exemplars of the various classical deities and Renaissance walks of life, the two sequences could easily have interacted at an early date, the tarot influencing the "Mantegna" and vice versa. Ady, Cecilia, 1937. The Bentivoglios of Bologna. Campbell, Stephen J., 1997. Cosmé Tura of Ferrara. Campbell, Stephen J., 2004. The Cabinet of Eros: Renaissance Mythological Painting and the Studiola of Isabella d'Este. In Google Books. Drogin, David, 2002. "Bologna's Bentivoglio Family and its Artists: Overview of a Quattrocento Court in the Making, in Artists at Court: Image-Making and Identity, 1300-1550, 2002, ed. Stephen Campbell, pp. 72-90. Dunkerton, Jill, 2002. "Cosmé Tura's Painting technique," in Cosmé Ture: Painting and Design in Renaissance Ferrara, ed. Alan Chong, pp. 107-152. Giovannoni, Giannino, 1981. Mantova e i tarocchi del Mantegna. Lambert, Gisele, 1999. Les Premieres Gravures Italiennes: Quattrocento--Debut du Cinquecento. Seznec, Jean, trans. 1953. Survival of the Pagan Gods: The Mythological tradition and its Place in Renaissance Humanism and Art, trans. Sessions. Syson, Luke, 2002. "Tura and the 'Minor Arts': The School of Ferrara," in Cosme Turé: Painting and Design in Renaissance Ferrara, ed. Alan Chong, pp. 31-70. Vasari, Giorgio, 1871 translation of 1550 original. Lives of the Most Eminent Painters, Sculptors, and Architects. Vol. 2, translator Johnson, in Google Books. Venturi, Adolfo, 1931. North Italian painting of the Quattrocento: Emilia. Re: The "Mantegna": 1450's Bologna? the four virtues in the St. Gallen text are definitely engravings and in their essence they are from the some copperplate as the later Mantegna Tarocchi E-series. As the artist used a composing technique, not all parts are identical, so for instance the cards have no numbers, there are differences with accompanying animals - but, anyway, the 4 basic figures are the same in smallest details. St. Gallen is in Northern Switzerland near to the German influence and the language of the accompanying text is old German. St. Gallen is a Benedictine abbey and between the Benedictines were many Germans, also in Italy. For instance: in Subiaco (near to Rome) is a Benedictine abbey and it also had many Germans, and it was in this abbey, that Pannartz and Sweynheim started their printing business in Italy, both Germans. They stayed till 1467 and then went to Rome. A work of Benedictine monks had naturally good chances to appear in another Benedictine abbey. 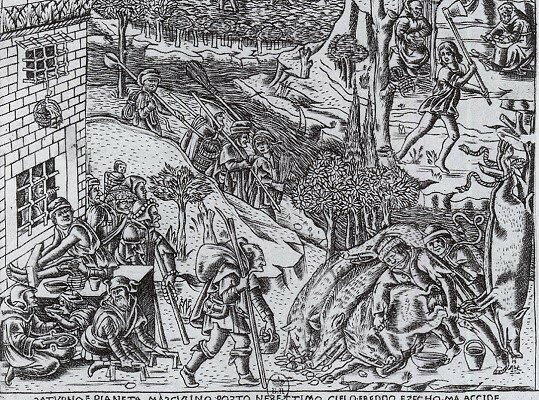 Manuscripts which used woodcut or copperplate illustrations in 1468 should be called very rare, copperplate engravings of the Mantegna Tarocchi engravings also, and one tends to assume, that the high quality of the e-series was not possible around ca. 1450. Lazzarelli bought his objects in a Venetian book store, maybe 1468-70 - this is known by a document, which is lost now, but about which was reported in 18th century). The illustrations, which appear in two different manuscripts in Urbino (1. the work of Lazzarelli himself - 2. a Martiano Capella edition) are definitely copies of these bought pictures, from which we don't know, if they all were made from one artist or from a unique series of 50 pictures or if they were engravings or pictures made by another technique. In the two manuscripts of Urbino appear pictures, which were not used in the Mantegna Tarocchi, so, if all the illustrations in the both manuscripts were made according objects, which Lazzarelli found in the bookstore of Venice, it were not "50 cards of Mantegna or somebody else", but possibly 100 or some less or some more - just a wild collection, possibly created by more than one artist, just put together by a selecting poet with the intention to use the pictures for his manuscripts. Generally it was common, that engravings were made according models, which appeared earlier in another technique - that's the common way of engraving production. It would be a little unusual, that first the engraving existed and then other pictures were made from the engraving model. Lazzarelli made his work first for Borso, but Borso died 1471, and then for the "duke of Urbino" Montefeltro. Montrefeltro became duke of Urbino in 1474, probably in Rome. Lazzarelli got 50 ducatos from the duke Montefeltro, the reason and the time is not known, probably for his manuscripts. Lazzarelli arrived in Rome 1473-1475 (there are contradictions), but Lorenzo Zane, his sponsoring friend, arrived 1473 and he met Lazzarelli before. There are two coins with Mantegna Tarocchi motifs, one for Lorenzo Zane (astrology) and Fabrizio, a relative of Giulio Varano (made 1471-1483), whose tutor Lazzarelli had been before (Lazzarelli worked for Varano, before he went to Rome). Varano, Lorenzo Zane and Montefeltro are all involved in leading manner in a military campaign, against a few cities near to Rome - finally against the Vitelli-family in Citta di Castello, the whole operation made under the guidance of the later pope Julius(1503-1512), in the time of the campaign summer/autumn 1474 cardinal and the nephew of the current pope Sixtus IV. Likely cause the success of this enterprise Montefeltro in 1474 got the title duke and also the contract was formed, that a further relative of Sixtus IV. should marry a daughter of Montefeltro. Likely in this context of festivities and contracts in late 1474 the Lazzarelli manuscript got in the hands of Montefeltro, who added them to his library. Sweynheim and Pannartz "worked" for the pope, the whole was interacted by the chief librarian of the Vatican Giovanni Andrae Bussi (lived till february 1475, the position was taken by Platina) and a sort of "publisher" Domitian Calderinus. On the other hand there is a close similarity between the present series and the engraved maps of the Ptolemy printed at Rome in 1478. The precise cutting of the maps and the representation of forests and hills are closely related in style. If the engraver of these maps is identified, some solution might be found for the engraver of the socalled Tarocchi might have undertaken the work of the Roman printer. What Hind didn't know ... in Germany it was a long established opinion since 19th century (based on enough documents), that the Ptolemy-edition was produced by Sweynheim, though Sweynheim was dead in 1478 and the business of the production was finished by an "Arnold Bucking" (which is either another name of "Arnold Pannartz" or another new printer/engraver, who in unknown manner got possession of the finished work). As a lot of connected persons died in this time, the whole operation did fall in obscurity (Sweynheim died, Pannartz possibly died or changed his name, Calderinus died, Bussi died) and Lorenzo Zane did fall in disgrace for some time (there was serious trouble between the later pope Julius and Girolamo, another nephew of Sixtus and husband to Catarina Sforza, with connected and proven murder intentions and Lorenzo Zane was involved; the papal circle decided to forget about all this and the matter went down "under the carpet", however, Lorenzo Zane had to suffer and Lazzarelli expressed himself as rather disappointed about his earlier sponsor Lorenzo Zane). Perhaps Lazzarelli's disappointment about Lorenzo Zane is a secret sign, that Lazzarelli as the collector of the pictures was cheated by Lorenzo Zane, who used Lazzarelli's collection in the manner, that Lorenzo Zane (and possibly other persons in the papal circle) used them without agreement of Lazzarelli (and perhaps changed Lazzarelli's concept, infiltrating their own ideas). Lazzarelli got 50 ducatos and "was paid" then ... and "felt disappointed". The known information sound, as if Lazzarelli hadn't been in Rome before 1475, although Lorenzo Zane arrived 1473. So somehow Lorenzo Zane might have stolen or modified the idea of Lazzarelli. Nonetheless Lazzarelli became a well accepted poet in Rome, but perhaps he had dreamed of a better business with his "treasure" found in a Venetian book store. The whole has the curiosity, that a long-time-printer Konrad Sweynheim suddenly was able to engrave in very high quality in 1473, attested by the Ptolemy edition. As Sweynheim shouldn't have been rather young, this seems a rather astonishing development, only explainable, if one assumes, that Sweynheim had learned engraving before. If Sweynheim made the 4 virtues in St. Gallen already 1464-67, the story would get a logical face. A production of 50 Mantegna Tarocchi in Rome 1475 is logical, cause 1475 was a papal Jubilee-year. Many pilgrims and tourists entered the city, willing to buy something, what they might bring back to home. The pictures of Bologna might have reached the collection by another "secretary of Lorenzo Zane", who had worked in Bologna before. It's a common feature in book production, also in modern days, that "publishers" arrange "works of authors" in a way, that authors never thought of. Disrespect of "copyright" and "author rights" were very usual in the early printing time. Hi, Huck. Thanks for clarifying the facts about the St. Gallen manuscript, and how the engravings of the Virtues might have gotten there: from a Benedictine abbey in Italy, perhaps one near Rome where Pannartz and Sweynheim had their business. Thanks also for clarifying what in Trionfi's view Lazarelli's role was. Wouldn't there have been a Benedictine abbey around Bologna at that time? I would be surprised if there wasn't. I want to make it clear that I wasn't saying that the engravings were from the 1450's, only the designs, in another medium, at least some of them. The project that became the "Mantegna" started in the early 1450's. Then in the 1460's we have high-quality engravings, we know that from St. Gallen, identical, as far as I can tell, to the corresponding "Mantegna" ones. Engravings of that quality could have been mid-1460's Bologna, even early 1460's. In nearby Ferrara, we have Mantegna's engravings at that time. 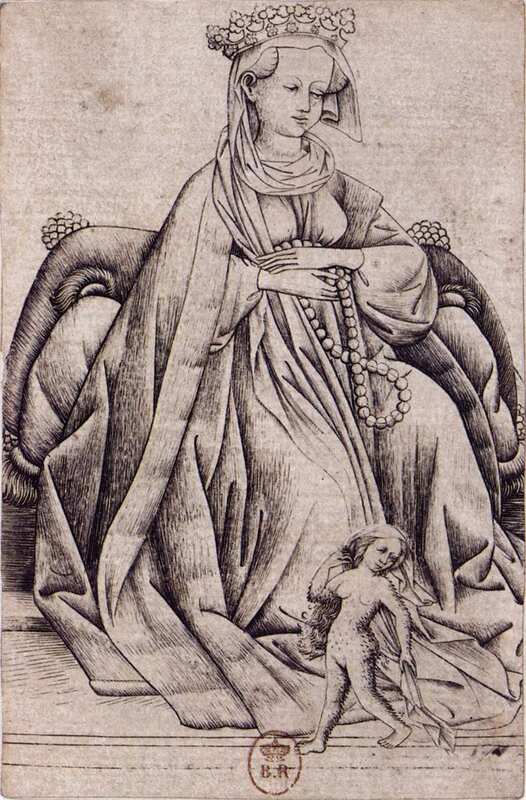 Florence had many high-quality engravings then (e.g. the Passion series in Vienna, the "Life of the Virgin" and Baldini's "planets" in Paris, all 1460's per Lambert, p. 37f). Bologna would have been similar, led by Francesco Francia (Lambert p. 20). It is possible that the pictures got to the abbey's engraver, wherever it was, in some other medium, such as woodcut, but there seems to me no reason to add that step. Drawings (the property of the artist or patron) and engraver could both have been in Bologna. Out of 34 pictures total, only 4 in the Lazarellli manuscript, and none in the Capella, do not correspond to "Mantegna" cards--although less well for some of the Capella. This is demonstrated by Trionfi (http://trionfi.com/mantegna/ and http://trionfi.com/0/m/06/). Lazarelli may have got the idea of the poem from seeing the engravings and bought the 23 that fit his purpose--and some that he might or might not use, from the same series, 7 or more--plus 4 more from another set, or he had his miniaturist draw the 4 according to his specifications (3 non-planetary gods and Eternity). There were some engravings he didn't use, so he sold some or all to Urbino with his manuscript. There a miniaturist, left to his own devices, got gradually bolder in his departures from the cards, so that by the time he got to Astrology (which Capella called Astronomy) he was really out there (http://trionfi.com/0/m/06/). Poetry, Theology and Philosophy weren't part of Capella's 7 Liberal Arts (http://en.wikipedia.org/wiki/Martianus_Capella). It is possible that the pictures Lazarelli bought were woodcuts or lower-quality engravings, which another engraver later used for the E-series "Mantegna," but again, I see no reason to posit such a complication. The main point for me is that the style and many of the figures of the "Conditions of Life" (not just 3), the Virtues, and the Muses, are already there by 1468, all in a similar style, and at least 4 in engravings identical (as far as I can tell) to the "Mantegna." 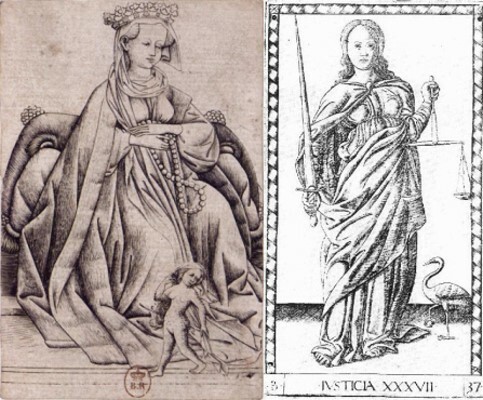 Paintings of Muses are already there in similar style, even in the early 1450's. And the Muses of the "Mantegna" are so similar to one another, most with a musical instrument, a sphere, similar robes, and not much else, although historically they had many other characteristics, that they must have been designed together, or at least in sequence. Although we have no evidence of these Liberal Arts pictures in the 1450's, they are in the same style as the Muses, so probably from the same artist. 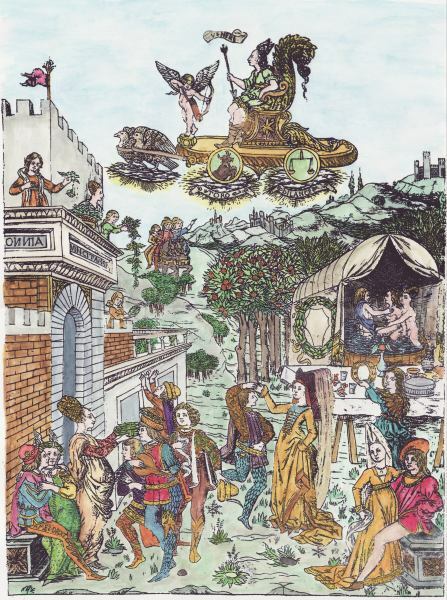 Images of the planetary gods and the 10 circles around the earth were also readily available, in the "children of the planets" series etc., supplemented by certain tarot images by then (also perhaps used in the Virtues). All this speaks for an organized collection of images at that time, and because of their simplicity probably made into drawings done for the express purpose of converting to printing. All the ingredients are there for the drawings to have been made between the early 1450's and the early 1460's. There is no reason to posit Lazarelli as a later intermediary doing the selecting, out of a much larger hodge-podge of prints, and then organizing them into groups with letters and numbers. Lazarelli and the Urbino miniaturist just didn't need those numbers and letters because they didn't fit their context. This is about Ulrich Rösch, the important man in St. Gallen in the critical time. It's recognizable in the German text, that there is a concrete relation between Rösch and Pope Pius II. (Enea Piccolomini) ... likely also to Cusanus and to Bussi, who had been secretary to Cusanus. All three engaged for book printing in Italy, and the result was, that Sweynheim & Pannartz went to Italy. Especially Bussi engaged and became manager and lector for Sweynheim & Pannartz. Finally he became the chief librarian of the Vatican, an important position. There might have been a Benedectine order in Bologna, I don't know, but Subiaco is the original place of Benedict of Nursia. I wouldn't think, that this "unknown Benedectine abbey in Bologna" had have a similar great place in the Benedict order, as Subiaco had been. Another (the next) is in Parma, a similar low number of members. In Pomposa had been one, but that's nearer to Ravenna and Ferrara. Out of 34 pictures total, only 4 in the Lazarellli manuscript, and none in the Capella, do not correspond to "Mantegna" cards--although less well for some of the Capella. This is demonstrated by Trionfi (http://trionfi.com/mantegna/ and http://trionfi.com/0/m/06/). I don't think, that you can take all the Capella pictures as totally similar. And actually I personally haven't seen all pictures in the Vatican manuscript of Lazzarelli's poem .. just the 10 in Kaplan p. 26-27. At least the Mercury representation would look like a "bad copy", if the often not too bad illustrator would have known the rather elegant Mantegna Tarocchi image as the "original". Interesting. 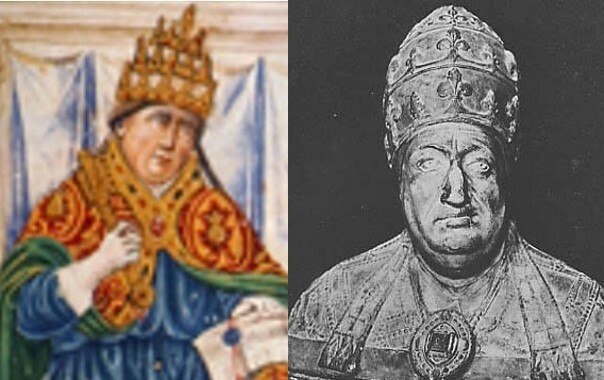 Pius II fits my speculations: Congress of Mantua, with visits to Bologna before and after, and a definite resemblance between him and the "Mantegna" Pope. Cusa is part of the "Mantegna" myth (although with impossible details). So why couldn't all or most of the cards have been engraved c. 1465 by Sweynheim & Pannartz (or even earlier in Germany but the printing done in Italy), based on designs from Bologna, and then sold in Bologna, Venice, etc. after that? One separate, verifiable connection between these engravers and Bologna (admittedly much later) is the Ptolemy maps, originally engraved in Bologna 1477 by Criveli, who was inexperienced in engraving, and redone by Sweynheim et al in 1478, as you point out. It might indeed help to see all the Lazarelli images. But it is in any case hard to tell whether the miniaturist did a "bad"/"improved" version of the card or the engraver a "bad"/"improved" copy of the miniature. From the technical side 1465 is a little early, if the Bolognese pictures and the 4 virtues wouldn't have existed, probably nobody would judge "1465" ... from Sweynheim's perspective Italian thinking should have been difficult, he had to learn a lot. And the Italians weren't so interested in copperplate engraving, I would assume, a culture has to learn, that black-white can be attractive. These connected persons wanted printed books, not copperplate engraving from Sweynheim, he wasn't allowed to waste his time - he was one of few persons, who could make it happen (this was different in 1473, when Sweynheim returned to engraving). And if Sweynheim has made a larger production in 1465, we probably would have known about his authorship. The missing author is better explained in the confusing situation of 1475, when already many engraved and all participating persons died and couldn't tell who made the stuff. Lazzarelli wouldn't have taken a great part of a well-known series to use it for another series. There are a lot of small things, which make a date of 1475 more probable. mikeh wrote: Interesting. 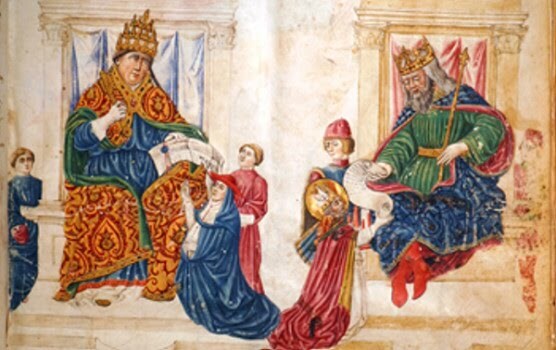 Pius II fits my speculations: Congress of Mantua, with visits to Bologna before and after, and a definite resemblance between him and the "Mantegna" Pope. Cusa is part of the "Mantegna" myth (although with impossible details). So why couldn't all or most of the cards have been engraved c. 1465 by Sweynheim & Pannartz (or even earlier in Germany but the printing done in Italy), based on designs from Bologna, and then sold in Bologna, Venice, etc. after that? One separate, verifiable connection between these engravers and Bologna (admittedly much later) is the Ptolemy maps, originally engraved in Bologna 1477 by Criveli, who was inexperienced in engraving, and redone by Sweynheim et al in 1478, as you point out. The argumentation of Brockhaus isn't so convincing, if you could read it in German. Criveli's and Sweynheim's production were parallel productions, Sweynheim worked since 1473 on it, there is no "redone by Sweynheim". The 'Rome Ptolemy' maps occupy an extremely important place in the history of early printing, and the story of their genesis is most fascinating. It begins with Conrad Swenheym, who is widely thought to have been present at the birth of printing while an apprentice of Johann Guttenberg. After Mainz was sacked in 1462, Swenheym fled south to Italy and arrived at the Benedictine monastery of Subiaco, likely at the suggestion of the great humanist and cartographer Cardinal Nicholas of Cusa. In 1464-5, Swenheyn, in partnership with another German émigré, Arnold Pannartz, introduced the first printing press to Italy. Over the next few years, Pope Paul II was to become so enthusiastic about the new medium that he liquidated scriptoria and commissioned several newly established printers to publish vast quantities of religious and humanist texts. In 1467, Swenheym and Pannartz moved to Rome under the Pope's patronage where they printed over fifty books from their press at the Massimi Palace. Unfortunately, when the pope died in 1471, the new pontiff Sixtus IV disavowed the numerous unpaid orders of his predecessor. In this new climate, Swenheym and Pannartz elected to move away from mass printing and to rededicate their efforts to creating the first printed illustrated edition of Ptolemy's Cosmographia, a work which was one of the greatest sensations of the Italian renaissance. By 1474 this immensely challenging endeavor was well under way, and Swenheym is recorded as having trained "mathematicians" to engrave maps on copper. They did, however have competition in the form of Taddeo Crivelli of Bologna, who was determined to be the first to the goal, even allegedly poaching one of Swenheym's employees who was privy to the project in Rome. Crivelli raced to complete the project, while Swenheym painstakingly guided the quality of his work, an endeavor slowed by the death of Pannartz in the plague of 1476. Crivelli's work was finally published on June 29th, 1477, making it the first printed Cosmography and the first ever set of engraved maps. Swenheym died in 1577, and the project was taken up by Arnold Buckinck, originally from Cologne, who saw the project to completion on October 10, 1478. While it may not have been the first printed edition, Rodney Shirley notes that 'The copper plates engraved at Rome ... [were] much superior in clarity and craftsmanship to those of the 1477 Bologna edition ... 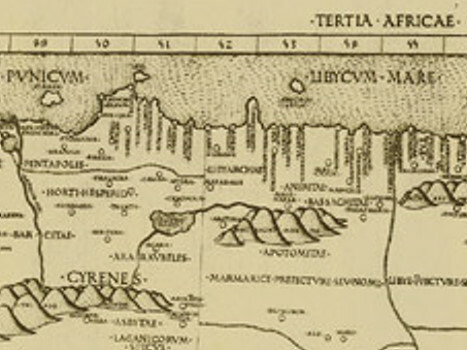 Many consider the Rome plates to be the finest Ptolemaic plates produced until Gerard Mercator engraved his classical world atlas in 1578' (Shirley p.3). Swenheym's close supervision of his engravers saw that 'The superior craftsmanship of the engraved maps in the Rome edition, by comparison with those of the  Bologna edition, is conspicuous and arresting. The cleanliness and precision with which the geographical details are drawn; the skill with which the elements of the map are arranged according to their significance, and the sensitive use of the burin in working the plates - these qualities ... seem to point to the hand of an experienced master, perhaps from North Italy' (Skelton, p.VIII). A number of authorities have suggested a principal engraver from either Venice or Ferrara. Another aspect of these maps which stands out is the fine Roman letters used for the place names on the plates. In an apparently unique experiment, these letters were not engraved with a burin but punched into the printing plate using metal stamps or dies. These fine prints represent a milestone in the medium, being some of the earliest successful intaglio engravings, quite apart from their undeniable cartographic importance. While the artists who carried out Swenheym's vision will likely never be known, they produced the most important and artistically virtuous printed maps of the fifteenth-century. Upon the publication of the Rome Ptolemy, a frustrated Crivelli saw potential clients abandon his edition in favour of its superior rival. Petrus de Turre (Pietro de la Torre) purchased these same plates and on November 4th, 1490 first used them to print a second Rome edition, of which this map was a part. The plates had remained in excellent condition and the original sharpness and quality was preserved. This map remains one of the most historically important and visually striking images of the Crimea and the Caucasuses available to collectors. An interesting interpretation ... but I'm not sure, if this story is really totally based on documents, or if missing parts are filled with too much "concluded fiction". Possibly somebody found new documents, but I have my doubts. For instance "Pannartz died 1476" ... who knows this for sure? "Another aspect of these maps which stands out is the fine Roman letters used for the place names on the plates. In an apparently unique experiment, these letters were not engraved with a burin but punched into the printing plate using metal stamps or dies." ... ... this was already suggested by Breithaupt 1779 ... and Breithaupt stated, that this was the first engraver who did so. This should actually have been the idea of a printer, not an engraver. The writing of the names of the e-series motif is apparently better than those of the s-series, although the arrangement really doesn't look perfect. Possibly Sweynheim experimented with the above described technique and perfected it later. I don't have Mantegna Tarocchi pictures, which are good enough, but I think, that the letter "O" for instance seems to be to be ALWAYS smaller at the side as on top and bottom ... only possible, if the artists used stamps, as at the Ptolemy. cheit wan #### ir ist das reiche der himel"
Definitely an old German manuscript. This should be the picture, about which it is said, that the ink crossed the border and that the ink is above the print, so that the print should be older than the writing (not recognizable in the copy). It's recognizable, that the picture is made from two engravings, one presenting the border, the other the figure. The feets are crossing the border, which appears not in the e-series. Also there is an animal and a black horizont in the e-series, which appears not in the manuscript. Otherwise even very small details of the figure seem to be more or less the same in both pictures, disregarding small mistakes, which might have evolved by misprinting or age of the plate ... so with high probability they are made from the same plate. Otherwise even very small details of the figure seem to be more or less the same in both pictures, disregarding small mistakes, which might have evolved by misprinting or age of the plate ... so with high probability they are made from the same plate. But how would (1) have been managed? The engraver would have had to be involved in the production of the manuscript pages. Here is one scenario for how: If Swenheym got to Subiaco in 1462, and the printing press wasn't set up until 1464-1465, he had time on his hands, and perhaps needed to do some labor in exchange for his room and board. Somebody at the monastery in Bolobna (or wherever) had seen the designs, in whatever medium, and sent copies to Subiaco. He didn't need a printing press to produce engravings, so he made engravings on the paper to be used for the manuscript. We don't know how many plates he made, from how many designs. He could have made quite a few, from quite a few images, while he was waiting for his press. And he didn't have to do the border each time; he had one plate for that. Mmaybe Sweynheim did the engravings before the printing press was set up, and it wasn't a big production at that time. Then maybe he sold the plates to someone else, who did the lettering in Venetian dialect. Who knows? However one problem to Sweynheim remains: did he engrave "proche de la maniere fine Florentine," as Lambert characterizes the style? If that is the style, then we have to consider another scenario. I wouldn't think, that this "unknown Benedectine abbey in Bologna" had have a similar great place in the Benedict order, as Subiaco had been. So here's an alternative scenario for a Bolognese (or Ferrarese, for that matter) production of the engravings. Someone at one of the monasteries near Bologna (or wherever), living there or visiting, saw the designs and had the engraver in that city (not in the monastery itself) put the designs on the paper to be used for the manuscript. The paper was then sent to wherever the manuscript was written. ...I think, that the letter "O" for instance seems to be to be ALWAYS smaller at the side as on top and bottom ... only possible, if the artists used stamps, as at the Ptolemy." Your observation about the stamps is interesting. I assume you are arguing that uniformity implies stamps. I looked at the E-series images reproduced in Lambert. The "O" to me looks less round in Misero than Fameoi. The "O" in Erato is different from the "O" in Polimnia." If my observations don't fit your copy, I will scan and post mine. (There are currently 13 complete sets of E-series cards, per Lambert!) On two cards, Merchadante and Melpemone. the "N"is backwards, but everywhere else it is done right. That suggests to me a hand-letterer's careless error, forgetting to make it backwards. The "M" in Arithmetricha is different from the "M" in Musicha. Also, the lettering varies slightly in size (font, as we would say) from card to card, depending on how many letters there are in the word. "Terpsichore" is smaller than "Erato." So I would guess that this lettering was done before Swenheym started using stamps, although I have no idea how they made it look so good. I did read Trionfi's excerpt on Cusa etc. in German, with some help from the translation machines. It is to be sure not impressive. That's why I spoke of the "Cusa myth" with its "impossible details." But sometimes there's a grain of truth amongst all the romanticized fantasies. That's why Cusa still seems to me relevant. The "Mantegna" looks to me quite consistent with 1465. There is the Baldini series on the planets, for example, from 1460-1464, which spawned many copies starting 1465. Bologna appears to have been a hot-bed of gambling in the early XV century, and it needed St. Bernardino n his lenten sermons in this city in 1424 to persuade the players to burn their cards. (History of Woodcut/i], vol. 1 p. 80f). And of course along with playing cards there would be woodblock prints on other subjects. Deux centres importants d'activite se distinguent en Italie du Nord, Florence avcc les orfevres Maso Finiguerra (1426) et Antonio Pollaiuolo (1431/33-1498), Bologne, avec Francesco Francia (vers 1450-1517) et Peregrino da Cesena (vers 1490-vers1510). Finiguera is the artist whom Vasari credits with the invention of copper engraving in 1460 (Lambert p. 5). But the production of "nielles" is documented from 1452 and 1455 (p. 5). D'aitres documents permettent de savoir qu'il etait le fils d'un orfebvre florentin et qu'il travailla pour la guilde des merchands de Florence, qui lui commanda deux paix niellees, l'une en 1452, l'autre en 1455. Clles-ci ne peuvent etre identifiees precisement avec laes paix niellees connues ou conservees. These are not just engraved gold surfaces, blackened to make the engravings stand out, but prints on paper made from such "plaques." Lambert gives numerous examples, starting in 1452. Given the close contact between Florence and Bologna in the early 1450's, I would guess that Bologna had black and white engravings around the same time as Florence, at first imported from there. Then after 1460, copper engravings were extremely popular, e.g. Baldini's "planets" series, as I have said. So it appears that the Italians were quite familiar with black and white images before 1460, and with ones similar to the "Mantegna" sometime 1460-1464. In any case, the evidence so far suggests that if the "Mantegna" engravings didn't mostly exist by 1468, then something very much like them did, probably odesigned in Bologna (or if not, then Ferrara), engraved either there or in someplace with connections to a Benedictine monastery, yet "proche de la maniere fine Florentine"--near to the Florentine fine manner--and printed in one of those places or Venice, but by a firm also able to sell in the Venetian market. mikeh wrote: When you say "both pictures" and "they are made from the same plate, what, physically are the "they"? One of course is the "Mantegna" card. You've papers, if you wish of different size or different sorts, and one copperplate ... and the engraving process causes, that the picture on the copperplate appears on the papers. In a manuscript you can use the printed paper for additional writing or whatever you desire. By bookbinding different papers of same size can be organized to become a book. The time, when they reached Subiaco, is not known (mostly it's said, that they arrived 1464), and before they could start to print, they had to manufacture their letters and the printing press. Printing couldn't start immediately. Surely Sweynheim could have made more than 4 engravings in his free time, but he didn't knew, which pictures Lazzarelli would buy in 1471. 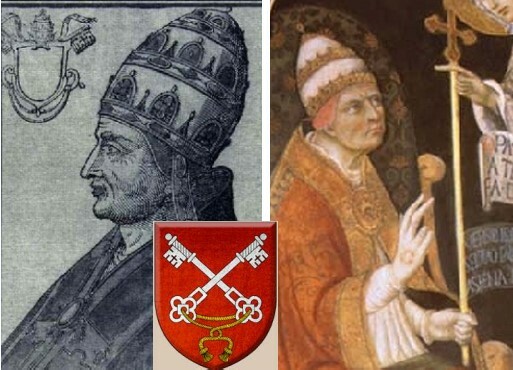 The Venetian dialect might have been caused by Lorenzo Zane and the general strong Venetian-Papal connection ... pope Eugen had been from Venice and pope Paul II. was his nephew. Pope Sixtus IV (from Savona near Genova) turned more towards Milan, but the Venetian lobby in 1474 still was in Rome and Lorenzo Zane was a part of it. He did fall in disgrace some time later, though Sixtus participated with Venice in the war against Ferrara later. Perhaps Zane saw a big market for these pictures in Venice. Venice saw an explosion of the printing business around 1471. Before Rome had been the center of Italian book printing. Not only Sweynheim & Pannartz, also Ulricus Han worked there. Sweynheim entered the discussion, cause Hind believed, that the engraver of the Ptolemy edition of 1478 might have been the engraver of the e-series ... Hind didn't know, that this was already recognized as Sweynheim. Greater parts of the Mantegna Tarocchi appear in the collection of Lazzarelli, and in 1471 or little before there was no connection between Sweynheim and Lazzarelli, who bought his pictures in Venice. Generally a "Ferrarese style" is recognized and it's known, that the Muses as a theme developed in Ferrara. The distance Ferrara-Venice isn't very far, and it seems logical, that some Ferrarese artists used Venice as a selling place for their art. So Sweynheim had to copy them and naturally produced "Ferrarese style" ... but for the virtues he took engravings, which he already had. This engraving style was possible in Germany ca. 1455, whereby the date is flexible and might be even earlier. There are weaknesses of the artist in making the hands, which are quite better in the Mantegna Tarocchi. But if an artist changed from Germany to Italy, he probably had opportunity to improve in these details. There are many alternatives, a whole universe of alternatives, but Sweynheim was "recognized" as a possible candidate by Hind. Well, I don't know ... somehow the results depend on the working technique. If the artist used single letter stamps "free hand" to hammer them on the plate, the technique possibly creates variants and the artist has problems to estimate the distances between the letters and to find the precise vertical direction. Also he might find reason to "improve" by scratching a little bit on the plate here and there. Also the age of the plate might play a role. Cusa is relevant, as he already in 1452 ordered some printing from the Gutenberg printing house. And cause he had insider knowledge from North and South of the Alps. And cause he had stronger relations to Enea Piccolomini already since youth, and Enea also had insider knowledge of North of the Alps. Naturally these both combined to transfer printing technology to Italy. I've seen Hind's collection about early Italian engraving and wasn't so much impressed. Engraving catalogs of German and Flemish engravers offer much more. But I'm not a specialist. The positions about the distribution of woodcut technology differ. And about the hot-bed of gambling in Bologna: We know the few documents and we probably know them better than Hind did. And "gambling" mostly means dice, not playing cards or woodcut use. Too optimistic, I would assume. I would assume, that Italians found their colorful illustrations and paintings much more interesting. Even when something existed and can be proven in its existence, it doesn't mean, that it had a big participation of the public market. ... ... I don't know, what's so interesting in Bologna. Lazzarelli bought pictures in Venice, and it probably didn't matter to him, where they originated. These pictures somehow gathered inside the dominant papal circle around Sixtus IV in Rome. This circle caused a production, likely via Sweynheim, who was an established papal connection for engraving problems in Rome. Naturally it's interesting to us, who made these pictures, which Lazzarelli bought. But I don't see an easy way to answer this. But why just Bologna? And why just a Benedectine monastery? Sweynheim was in the Benedectine monastery of Subiaco, which has some logic together with 4 engravings in the Benedectine monastery in St. Gallen. But a lot of other artists weren't neither Benedectine monks nor living in Bologna. Lazzarelli bought his collection in Venice and we've no evidence, that virtues were between them ... perhaps some pictures were from Bologna, why not. And we've no evidence, that these pictures were engravings. There is no indication, that Sweynheim had anything to do with Lazzarelli before 1471. And Lazzarelli wasn't a Benedictine monk nor he had been in Subiaco or in St. Gallen. Lazzarelli struggled all his life to get a connection to the "upper circles", often without success. Lorenzo Zane was his hope to "arrive" in Rome, himself being captured at the Varano court of Camerino, as a provincial poet. Surely not the worst place in the world, but not enough for the high aspirations of Lazzarelli. Lazzarelli became an accepted poet in Rome after 1475 and was well accepted there, though "between others" ... not enough for his aspirations. In this new climate, Swenheym and Pannartz elected to move away from mass printing and to rededicate their efforts to creating the first printed illustrated edition of Ptolemy's Cosmographia, a work which was one of the greatest sensations of the Italian renaissance. By 1474 this immensely challenging endeavor was well under way, and Swenheym is recorded as having trained "mathematicians" to engrave maps on copper. They did, however have competition in the form of Taddeo Crivelli of Bologna, who was determined to be the first to the goal, even allegedly poaching one of Swenheym's employees who was privy to the project in Rome. Crivelli raced to complete the project, while Swenheym painstakingly guided the quality of his work, an endeavor slowed by the death of Pannartz in the plague of 1476. Mostly it's told, that Sweynheim and Pannartz parted their business, contradicting the above information. "Swenheym is recorded as having trained mathematicians to engrave maps on copper" is new to me, never I read this elsewhere. Mathematicians were possibly needed to solve map problems, connected to questions about the relation of the geographical maps and the world globe, not for "engraving problems", I would assume (though, it wood be convenient, if these mathematicans would be able to engrave). Nonetheless it's more than once speculated, that Sweynheim didn't work alone, possibly it connects to the problem, that there were simply very much work with these maps - something I can't judge. Also there is the problem, that Sweynheim possibly was already rather old (usually it's given, that he died 1475-77, this source states 1477 ... is this really documented ?) and possibly handicapped with his hands, so that he had to train others. Generally it's stated, that Sweynheim kept always contact to Mainz ... so if he used other engravers, he probably would have used German engravers, if possible. It's just a communication problem, Germans would have better understood, what he attempted to explain. German printers in Italy were very common in these times. Sweynheim died and "Arnold Bucking" from Cologne finished the business ... some believe, that Arnold Bucking was just another name of "Arnold Pannartz" ... an indication, that at least one other engraver participated. Many of the surviving Mantegna Tarocchi prints had been located in Germany, which possibly indicates, that the engraver was a German or somebody, who understood the German market. The Lazarelli manuscript has the names of the images in Venetian dialect already. Presumably they were already on the prints, since he bought them in Venice. Earlier you said that a big reason for thinking that the "Mantegna" was done in 1474-75 was to sell to pilgrims during the Jubilee. In that acase, if Zane were to make any changes in the labels in 1474-1475 it would have been to Latin or Tuscan (as in Dante, Boccaccio, and Petrarch), more familiar to pilgrims than Venetian. In fact, I find it a bit strange that he would have left the labels the way they were, considering that the pilgrims were mostly not from Venice. Generally a "Ferrarese style" is recognized and it's known, that the Muses as a theme developed in Ferrara. The distance Ferrara-Venice isn't very far, and it seems logical, that some Ferrarese artists used Venice as a selling place for their art. I don't know, what's so interesting in Bologna. Well, I gave several reasons for preferring Bologna as the place of origin for the designs and perhaps also the engravings. I wrote, "For Bologna, I offer (a) Galasso's move there, as the most likely candidate for the "anonymous Ferrarese" whose style is closest to the cards; (b) the marked divergence of the "Mantegna" from Borso's (as opposed to Leonello's) Belfiore Muses and most of the Schifanoia; (c) the presence there of the 1467 miniature, (d) the keys of the Pope card as Nicholas V's device [Bologna's favorite Pope, let me add], and possibly (e) the resemblance in engraving technique to Florentine engravings of the time [Bologna's ally] and (f) the later presence there of the Belfiore Euterpe and Melpemone. Moreover (g), Bologna, with its internecine feuds, suffered from too much passion and intensity; the elevated but conventional mood of the cards, in contrast to the best of Ferrarese art, would have been welcome there." But none of these arguments are strong. The 3 Muses were in Ferrara, where anybody with access to Borso's studiola could copy them, design engravings, and keep going, despite their incompatibility with the more fashionable styles of Tura and del Cossa. The cardmaker Gherardo da Vicenza, whom Campbell (1997) says did a lot of repetitive house decorations, could have been just such a designer. And the cards once printed could have gotten to Bologna easily enough. So I have to say Bologna is most probable, followed by Ferrara. My alternative, Bologna, is not one possibility equal to a universe of others. II have (a) Galasso's reported move there; (b) the 1467 manuscript; (c) German printers in town and nearby Benedictine monasteries, to account for the 1468 manuscript; and (d) the close association of Bologna and Florence, the center then of North Italian engraving. And other reasons already listed above. Political dissension further aggravated the turbulent state of affairs, and the moral tone was lowered by the extraordinary development of gambling-halls, where men of every age and condition of life played away their all and gave themselves up to debauchery. ...and those were the card manufacturers and sellers, one of whom came to Saint Bernardino with the complaint that he was depriving him of a living." "Whereupon the preacher, taking a compass at hand, described a circle on a tablet, in the center of which he drew the H.T.I. surrounded by rays." Apparently this was Barnardino's trademark; thus the man made more money than before. Well OK, this is not the most unimpeachable source; but it does mention cards specifically. If your research has turned up evidence to the contrary, I'd like to see it. And what about this, from Hind, previous page? Hind based his book on what was in the British Museum. Lambert's is based on the Bibliotheque Nationale. I wouldn't be surprised if Catherine de Medici took more stuff out of Italy than all the English tourists combined. You don't have to be a specialist just look at the pictures and read the dates that the specialists have given them. Unfortunately I can't find many examples on the Web. I tried to find Baldini's series on the "children of the planets," 1460-64; all I got was Adam Maclean's colorized version of Venus, http://www.alchemywebsite.com/paintings ... _Venus.jpg. But it gives you an idea of the style. And here is a detail from "Saturn," to show you the engraving style. There is also a very early Baldini at http://www.capurromrc.it/devil/84donnediavoli.html, not relevant in this context but maybe others. On his website, 2004, Maclean asked where he could find the whole "planets" series. I hope someone mentioned Lambert. ....I would assume, that Italians found their colorful illustrations and paintings much more interesting. Even when something existed and can be proven in its existence, it doesn't mean, that it had a big participation of the public market. The German engraving c. 1455 that you posted, Huck, mostly impressed on me as to how different it is from the "Mantegna" Virtue images in style. I post it below alongside the "Mantegna" virtue (the St. Gallen version that you posted is no longer there--where did you get it?). Then below them you can see how much more similar the standing Muses of Belfiore are. The differences tend to make me doubt that Sweynheim did the plates for the 1468 St. Gallen images. It is not simply a matter of doing them in the Italian style. There wasn't an Italian style--there were as many engraving styles as there were painting styles, all of them different from German ones. It's a matter of capturing a particular style, that of the three standing Muses at Balfiore, and getting the shading and lines in such a way that the feeling of the original comes through. That takes a familiarity with the style and practice in engraving it. Lazarelli's prints probably did have lettering on them, because his versions have the same titles as the "Mantegna" in the same Venetian dialect. So I assume there were plates for the labels and plates for the images, and one printer used both. The printer could have made the lettering, since letters were his specialty. One possibility is Jenson, who must have worked with Sweynheim (http://en.wikipedia.org/wiki/History_of ... typography); he moved to Venice in 1467 according to http://en.wikipedia.org/wiki/Nicolas_Jenson; . Since he was the leading designer of Roman typeface, he would have known how to make nice letters. The lettering on the "Mantegna," is pretty different from the letters on Sweynheim's maps, although the same style, as you can see below. Notice in the "Mantegna" the variations in the O, the M, the N, and the size of the print. I cut and pasted these from the Trionfi images. (The images in Lambert, and also elsewhere on the Web, are much clearer, but Trionfi's will do.) In contrast, the map's letters are all the same, and only in a few quite different sizes of print. We know there were German editions put out; perhaps that stimulated people there to collect the originals. In any case, there were I think German printers in Venice and Bologna both during this time; I will try to find where I read it. And there was the University of Bologna, with lots of German students.